Secret Codes are generally defined by the applications installed on the device. Some of them are specific to some devices, some others aren't. As we all know Chinese mobiles are spreading wide in market in many countries now. In one of my previous posts, I shared with you, Android Device Secret Codes (Hidden Secret Codes for Google Android Mobile Phones). 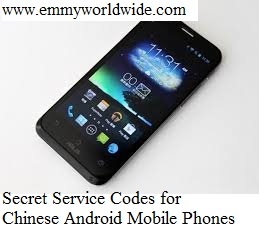 Today, am sharing few secret service codes for Chinese Android mobile phones. Hopefully this Hidden Secret Service Codes for Chinese Android Mobile Phones work for you. Feel free to share this post with your friends and tell your friends to share it with their friends.